How do you feed cows in a robot? Q. What are some import feeding practices for dairy cows milked with robotic milking systems? A. The goal of every dairy feeding program is to develop a low cost diet that meets the nutritional requirements of cows while optimizing milk production and cow health. In most conventional herds, this is accomplished by feeding a totally mixed ration (TMR) where all the ingredients are mixed together and delivered to the cow. 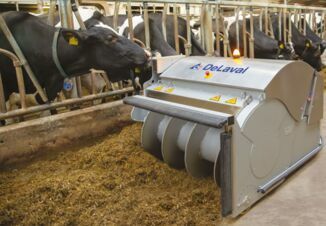 For robotic milking system (RMS) herds, a partially mixed ration (PMR) containing all the forage and some of the concentrate is offered in the feed bunk. An additional amount of concentrate is fed through the RMS milking station; this amount varies according to the cow's stage of lactation. Q. What brings cows to the milking station? A. Feed that is offered pelleted through an RMS is the major motivating factor to attract cows to consistently visit the milking station. However, cow's attendance to the milking station is not only dependent on the PMR and pellets offered in the RMS, but also on feeding management, cow comfort, cow health, and social interactions among cows. In a survey we conducted at the University of Minnesota, nutritionists indicated that quality of the pellet offered in the milking station and consistent mixing of the PMR were the two biggest feeding factors contributing to RMS success. Q. Is there research to support these ideas? A. Rodenburg and Wheeler (2002) showed that in a free flow RMS, feeding a high quality pellet (hard pellet with few fines made from palatable ingredients) increased the number of voluntary milkings from 1.72 to 2.06/cow per day compared with feeding a low quality pellet. We observed that at start-up of a new RMS, nutritionists and farmers focused on developing a pellet formula that encouraged milking station visits. Once they had a pellet that worked well, other factors became more important. Many producers commented that even minor changes in the PMR moisture, consistency of the mix (i.e., long hay that is difficult to process to a consistent length), and changes in forage quality affected visits. Q. What are some of the challenges? A. If forage moisture changes and rations are not adjusted promptly, visits may drop. The drop in visits will result in a decrease in milk production and an increase in the number of fetch cows. The increase in fetch cows may disrupt other cow behaviors, resulting in even bigger decreases in visits and milk production, leading to a downward spiral that creates much frustration for the producer. It is crucial to have consistent feeding in order to maintain high production and minimize the number of fetch cows. Q. What are the differences between free flow and guided flow barns? A. In barns with free flow traffic, cows can access all areas of the barn without restriction. In guided flow traffic, one-way gates and selection gates are used to guide cows to milking, feeding, and resting areas. There are two types of guided flow traffic - milk first and feed first. In the milk first system, cows leaving the resting area must pass through a pre-selection gate that determines if she is eligible for milking. If she meets the requirement to be milked, she is guided to a commitment pen that contains the RMS unit. If she is not eligible for milking, she is allowed to enter the bunk area and can only enter the resting area through a one-way gate. In the feed first system, cow traffic is the reversal of the milk first system. After eating the PMR, cows enter a selection gate that determines if she is eligible for milking. The gate either guides her to the commitment pen for milking or to the resting area. Farmer comments and our observations indicate that the milk first system is superior with the US style of dairying where economics demand high production. 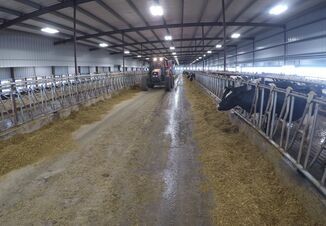 In feed first systems, cows fill up on the PMR and tend to stand in the feed alley or commitment pen chewing their cud without visiting the RMS milking station. Our survey of nutritionists revealed that feeding strategies were different for free flow and guided flow systems. Our survey indicated that the amount of pellets offered through the milking station averaged 11.2 lb/cow per day and ranged from 2 to 25 lb/cow per day. In free flow herds, the PMR was balanced for milk production levels of 10 to 30 lb less than the herd's bulk tank average milk production. Lead feeding is used in early lactation. By 14 to 28 days in milk, cows are being fed for 75 to 90 lb/day of milk. From 14 to 28 days in milk through peak lactation, cows continue to be fed nutrients that support 75 to 90 lb/day of milk or for actual milk production, whichever is higher. After this time, the feed delivery changes to feed cows for actual milk production and regaining body condition. Some farms with very high producing late lactation cows close to dry-off will develop a feed table for late lactation cows that decreases RMS station feed so cows drop in production before dry off. One challenge of free flow systems is that late lactation cows can become fetch cows. 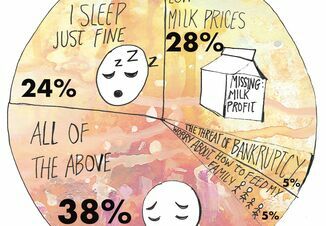 A key to preventing this is to have an excellent reproductive program that maintains high milk production through the end of lactation. Feed first and milk first guided flow AMS employ different feeding strategies. Feed first systems use a feeding strategy that is very similar to free flow milking systems and will not be discussed further. Our survey revealed that most milk first guided flow system owners have a different feeding philosophy than free flow. The amount of feed offered in the milking station is minimal and only used to entice cows to attend the milking station. A higher percentage of the dry matter intake is delivered through the PMR. One main reason farmers install guided flow RMS is the desire to feed less of the more expensive pelleted feed through the milking station. In our survey, farmers with milk first guided flow systems fed from 2 lb to 12 lb of pellets/cow per day. The average amount fed across all herds was 7.9 lb/cow per day. Commonly, 1.5 to 3 lb of pellets are fed at every milking visit. Since higher producing cows are guided to the milking station more frequently, they receive more RMS pelleted concentrate. The PMR in guided flow systems tended to be slightly higher in energy (0.015 Mcal NEL/lb DM) and lower in NDF (2.1% of DM) than the PMR in free flow systems. For guided flow herds, the PMR was balanced for 9 to 20 lb less milk production than the average of the herd. This difference should be expected between the two systems. Using a high energy density PMR in free flow barns may lead to more fetch cows or decreased milking frequency, resulting in less milk production per cow, whereas in guided flow barns, cows are guided to the milking station through the selection gate. Q. What are the important take away messages? A. The rapid growth on the number of farms using RMS in the US is expected to continue. The complexity of balancing the ration in the PMR and feed offered in the milking station can be a challenging task for nutritionists. Based on research, surveys of nutritionists, and farmer comments, the most important factors affecting feeding success include a high quality pellet and excellent feeding management. Research shows that pellets are better than meal and that a very hard pellet made from highly palatable ingredients will minimize fetch cows. A focus should be on optimizing milking station visits and health of early lactation cows. It is important to balance energy in the PMR with pellets fed through the milking station to optimize visits and minimize the number of fetch cows.